In a future where natural resources are overstretched and technology is everywhere, robots (sic) can satisfy any human whim -- except children. The Sixth Sense's Haley Joel Osment plays David, an android in the image of a boy, the first programmed to love. David is tested by a Cybertronics employee (SAM ROBARDS) and his wife (FRANCES O’CONNOR), whose own terminally ill child has been cryogenically frozen until a cure can be found. After some hesitation, the child's bonding program is activated and he becomes their child. But his happiness is short-lived. David becomes "obsessed" with the idea of becoming a "real boy", believing that that will win back his "mother's" love. Thrown on his own resources, with only the faithful supertoy Teddy, David sets out on a quest to find the blue fairy and become a real child. "In the 1980s, Stanley Kubrick took me into his creative confidence to tell me an absolutely beautiful story that was impossible to forget," says Steven Spielberg, longtime friend of Kubrick’s, who ultimately wrote and directed A.I. "I think it was the careful blend of science and humanity that made me anxious for Stanley to tell it, and after he was gone, led me to want to tell it for him." A science fiction (SF) story with strong Pinnochio references, an android silhouetted against the full moon (remember the kid on the bike? ), and a big budget -- has to be Steven Spielberg. "You make her a real mother, I make them real women." 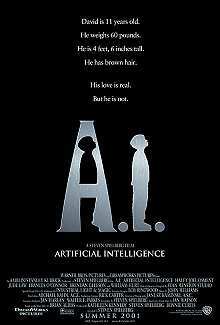 AI is an entirely male-centric story, the central characters are male, a boy android aided by a male android, created by a man in the image of his own son. The story is riddled with fairy tale references and has a very choppy structure, moving from part to part of the tale without believable segues. 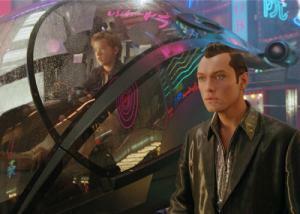 While the special effects are, of course, amazing, the film it is going to leave a lot of people unsatisfied.